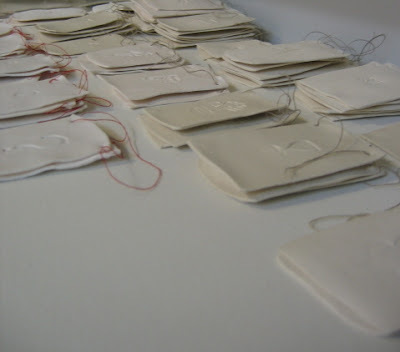 I thought I should let you know that I have a whole bunch of new porcelain tags available in my shop. They are love leaning in theme but we all know love is good thing to have around us all year long. I will continue to make new ones available but the motifs are constantly changing so if you want to add something new to your collection or for that matter start a new collection, now would be a good time. 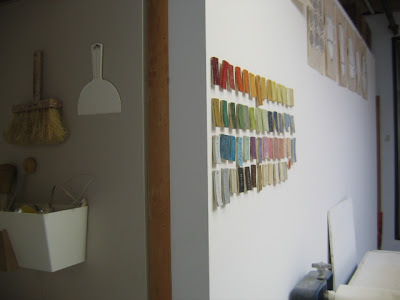 Have I mentioned lately how much I love my new studio space? It is so wonderful to be there and the only thing that could make it more perfect would be warm running water and it be out my back door...but I am not complaining. The light alone can't be beat. I have been feeling a little guilty about my neglect of this blog lately though guilt really isn't the right word for it. I am just distracted by other things and I do have to confess I have been a little enamoured with this lately. It seems to be more representative of my mood. Quiet and contemplative. Never the less I do have things that I must tell you about. So scoot on up a bit closer and have a quick listen. 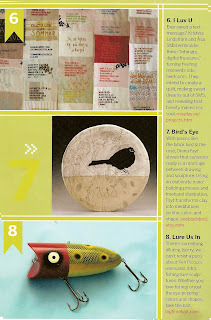 First of all I have been featured in yet another magazine, Mary Engelbreits Home Companion. They even printed a quote from me. Wow what a thrill to see my words in print like that! I have been very fortunate with so much press lately. It is really lovely to be noticed and I do have this satisfying feeling watching the pile of books and magazines stack up that include a bit about me and/or my work. I never in a million years dreamed such would be so. So thank you kind press people. I send you a million kisses! (whether or not you want them). Meanwhile I am busy with so many new things. I am working on developing some small vases. My mold guy, handsome Hector, is coming to visit my studio this week and hopefully he will be making some new molds for me very soon. 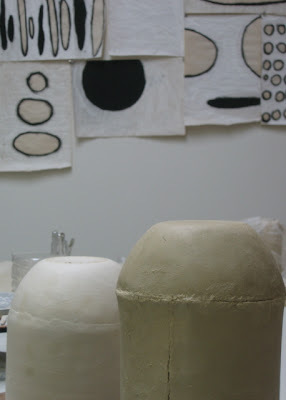 Also I am working on some new pieces (see above photo and no they are not large phalluses...they are upside down vessels) for an upcoming show called Line & Color that I will be participating in Atlanta, Georgia hosted by MudFire in April. I also just got an invitation to participate in an NCECA exhibit hosted by Santa Fe Clay called La Mesa that features 150 place settings. I will be one of many ceramists making a table settings for this show. So much already and its only three weeks into January. So its been a while since I have actually shown anything ceramic, hasn't it? The last couple of months the work was flying out of the kiln and straight into boxes and was being shipped off to far away places before I even had time to get to know my own creations. My children left without as much as letting me button their coats. Luckily they went off to warm and safe homes where they are loved and very appreciated. The above three went to a new store that just opened up in Napa Valley, called Fete. I scrambled to get the work finished in time for their store opening and there was a moment when I did not think it would happen. Luckily the fates (no pun intended) were with me and I had a number of pieces for the store that I was quite proud of. It was a nice contrast to the sense of constant disappointment that I felt I was creating by not having things to the stores when I promised. In the end I got most things done with the exception of one special order that I am on the third round of remaking because the plates keep peeling. So what is a girl to do? I did my best. I worked hard. Really hard. Besides there is January. Sweet slow sleepy January. I am using this time to catch up on all the things that did not get done before the holidays but at a more reasonable pace. Thank god for January! So many things were happening at the years end of 2007. I got a wee bit overwhelmed and let a few slide by without immediate mention but they certainly were not forgotten. Besides I am prouder than heck...so better late than never! I am happy to announce that my 2007 calendar is featured in a beautiful new book called Choosing and Using Paper for Great Graphic Design published by Roto Vision. 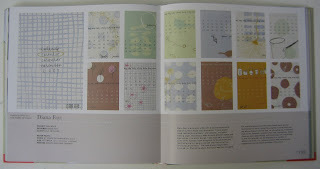 The spread is gorgeous and I am in such good company...There is page after page of gorgeous examples of paper and print. If you get a chance check it out. 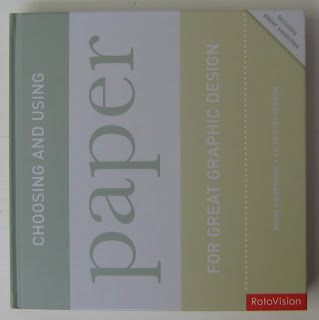 This book is must for graphic design and paper mavens. And then there was this lovely feature. 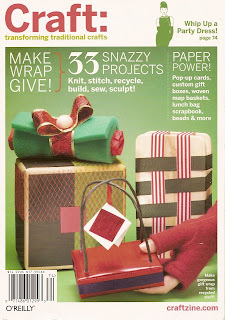 Boy is it a beautiful magazine and they have so many great ideas for projects. If I wasn't already so busy with my own I'd make each and every one in it. I am happy to announce (and in a timely fashion at that) that the new blog adventure I promised to share with you is now ready for your viewing pleasure. It still has a few glitches that have to be worked out but I think for the most part it is ready for guests. The purpose... Honestly I just have a lot of stuff that rattles around in this here brain of mine and I have been craving a place to share it. Stacks of sketchbooks that are filled with drawings from over the years. Weird stories that need to be told and photos that want to be shared. There is no intended order to it other than to document it as it comes up. The point being that there is no point. Some if it will be meaningful, some of it will not. I might have something to say or nothing at all. I am not yet sure what it will become but I am excited to see what will transpire. Either way I hope you will all join me in this new adventure. By the way, in case you were wondering, One black bird isn't going anywhere. I will still continue to check back in here and keep you posted with studio news, my new work and upcoming events.